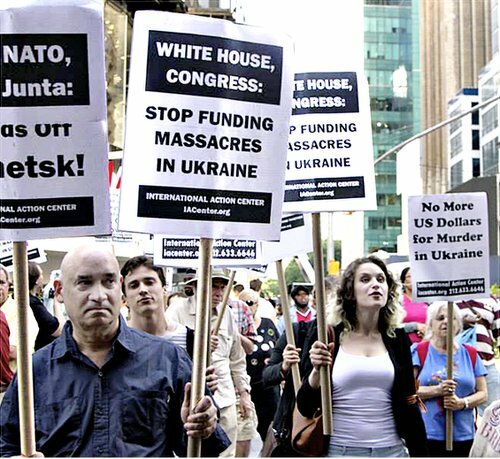 The International Action Center, joined by activists from Fight Imperialism, Stand Together (FIST), held an emergency protest at the downtown end of Times Square in New York on June 6 to educate and mobilize against the attack on the people of the Donbass region of Ukraine. The Kiev-based regime, with full support from U.S. and European Union imperialism, has already murdered hundreds of resisters and civilians in eastern Ukraine. Give and take with passersby was held in Russian and Ukrainian, as some participants in the anti-war action came from that region. The demonstration marched to the New York Times building to protest media distortions of the events.